An atmosphere creates the beautiful aurora borealis in the north - what does your relationship atmosphere create? The aurora borealis is a result of a collision of charged particles from the atmosphere of the Sun's intense heat and the gaseous particles in the atmosphere at the northern hemisphere of the Earth (one could think of a few metaphors for your relationship in this)! I have had the privilege of seeing the aurora borealis, and the colors and waves of color are beautiful. It brought to mind some atmospheres that were the opposite of that, as I was hearing from couples that were having much difficulty in their relationship. The atmosphere between them was extremely toxic and they were in a loop that kept creating intense animosity between them. They felt hopeless and had thoughts of just leaving the relationship. Really quite the opposite of the beauty and majesty of the aurora borealis. The reality is both of them longed for that breathtaking beauty in their relationship but had lost their way and were in a spiraling pattern downward. If you relate to this - what are some things you can do about it? Give up trying to do the same thing over and over and hoping for a different result. If you keep doing the same thing but just do it more and harder, it just does not work. It adds to your story of being a victim and it adds to a dark atmosphere in your relationship. Choose to see your partner in a positive light first. Couples who are successful look at their partner in this way. Couples who are not making it are looking at each other in an automatically negative way. They are often mind reading their partner (if we could only mind read!) from intense feelings of dissatisfaction and in the absence of truth. This form of negativity lowers your mood, fuels your anger and adds to a dark atmosphere. Choose to take responsibility for having at least five positive transactions for every one negative in your relationship (as recommended by Gottman and others). Count them and find ways to do this. It will make a huge difference. This means that you will leave your grumpy mindset from work at the door and that you will bring up issues that need to be resolved between you in a judicious way. Couples who are not making it are arguing constantly about the little things as well as the big things. This adds to a dark atmosphere between you. Look at the characteristics that represent your best self. Let them show up in your relationship daily. Learn to love your partner well. Look at your behaviour and who you are in relationship while you are in a spiral downward. These negative characteristics that your friends don't often see add to a dark atmosphere in your relationship. 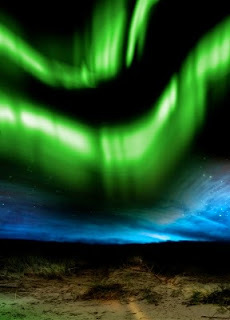 These ideas will help you to begin to create an aurora borealis atmosphere in your relationship. A better atmosphere helps you both to have hope and to be your better selves. It is a great beginning. However, you would need to see a therapist if your current poor atmosphere in your relationship is more then just a bump in the road. Go forth and be wonderful! Image courtesy of Victor Habbick and Freedigitalphotos.net.